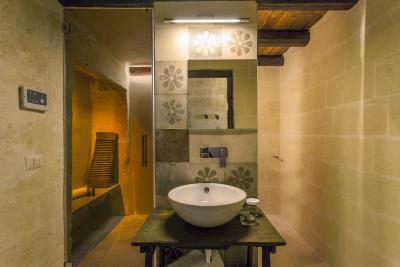 Lock in a great price for Corte San Pietro – rated 9.6 by recent guests! This is the most amazing hotel I’ve ever stayed in. The staff are the best I’ve ever experienced. 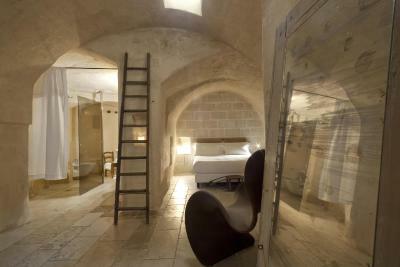 Highly recommend this hotel when traveling to Matera Italy. Bravo to the staff and facility. Lovely receptionist Anna so helpful. Grand location. Gorgeous hotel. The room was wonderful. Comfortable and clean. The loft bed room in our room was a nice place to both sleep at night and relax in the day. The breakfast was very good. The staff were all terrific. Fantastic welcome, great location, comfortable bed. 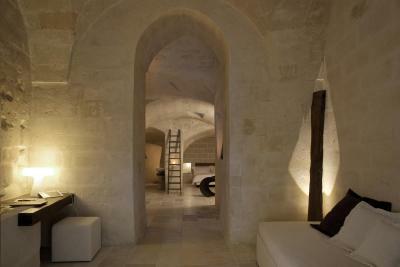 This hotel is enchanting, the rooms are built into the caves of Sassi and the decor is unique and sophisticated .. the city is breathtaking , restaurants are within short walk and food world class, and breakfast is delicious.. the owner and staff are wonderful .. this city should be on everyone's travel list . Kind and amiable proprietors who ensured that our stay was as pleasant as possible, the room, although the smallest in the complex, was beautifully designed with a very comfortable bed, and nice touches such a fresh fruit and water each day made for a very enjoyable experience. 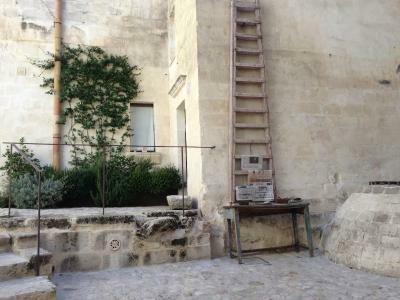 The town is fascinating and great for exploring on your own away from the tour and school group masses, which unfortunately seem to be overwhelming the character and ambience of the sassi. Fantastic staff and family run business. Pride of ownership, charming, lovely, kind, super accommodating. Lovely grounds. Easy walking into town, it's right there in the middle of everything and yet no noise. Courtyard is gorgeous. Wished we could have stayed longer but hotel was booked solid. Corte San Pietro This rating is a reflection of how the property compares to the industry standard when it comes to price, facilities and services available. It's based on a self-evaluation by the property. Use this rating to help choose your stay! 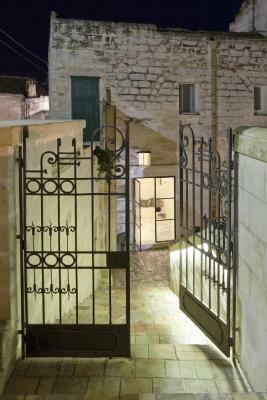 One of our best sellers in Matera! 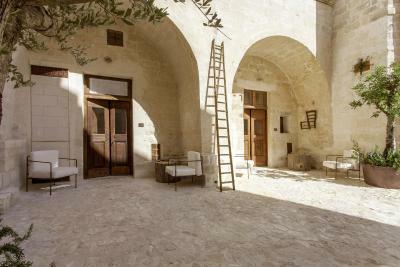 Set inside the Matera Sassi UNESCO site, Corte San Pietro is housed in a renovated historical building carved out of stone. 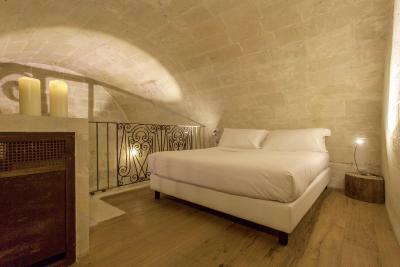 It offers rooms with a private entrance and free Wi-Fi throughout. 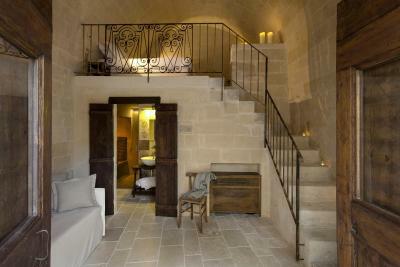 Featuring an elegant yet primitive style, each room is unique and furnished with hand-carved wood and stone items. 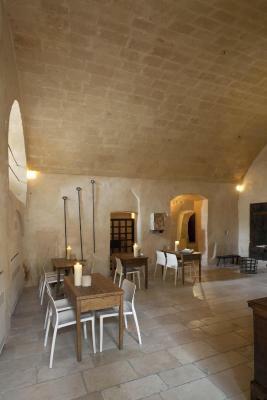 All rooms have a view on the internal courtyard, where breakfast is served in summer. 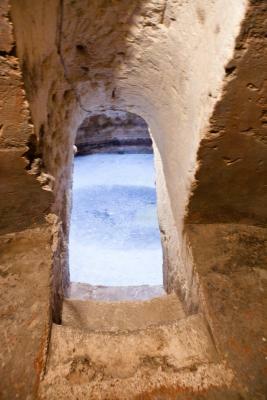 Guests at the San Pietro can request to visit an underground system of cisterns probably interconnected during the Second World War. A shuttle service, bike rental and tour desk are also available. Guests can enjoy discounted rates at a nearby partner car park. 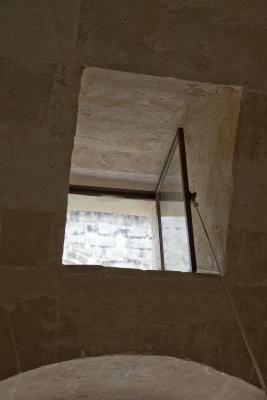 Matera Train Station is only 0.6 mi away, and a 5-minute walk will take guests to the town cathedral. 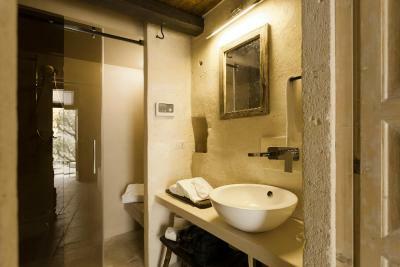 Set next to the Parco della Murgia Natural Reserve, the property is 31 mi from the Ionian Sea. 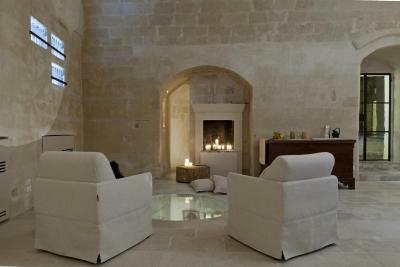 When would you like to stay at Corte San Pietro? 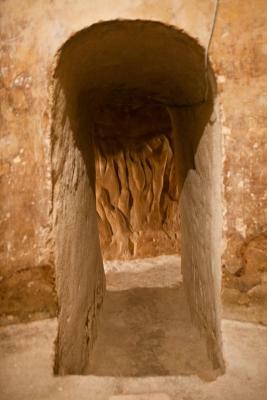 Carved out of stone, this unique room features an elegant yet primitive style. 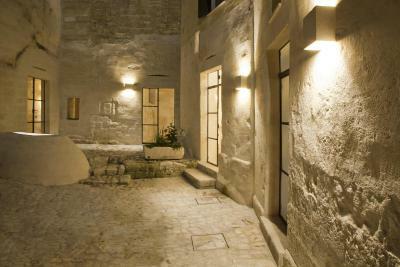 It is furnished with hand-carved wood and stone items and has a view on the internal courtyard. No extra beds in this room type. 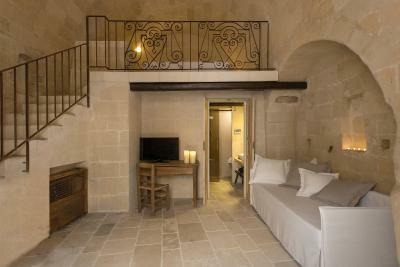 Carved out of stone, this spacious suite features hand-carved wood and stone items and has a view on the internal courtyard. 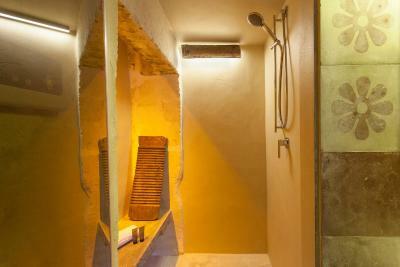 Has a stone bath or a spacious shower. 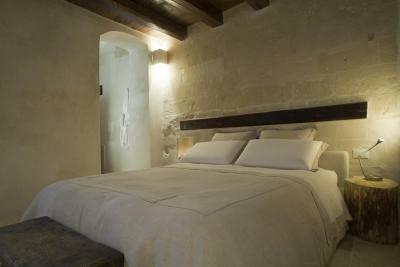 With stone walls and vaulted ceilings, this spacious, air-conditioned suite overlooks the inner courtyard and features a century-old chestnut wood table. 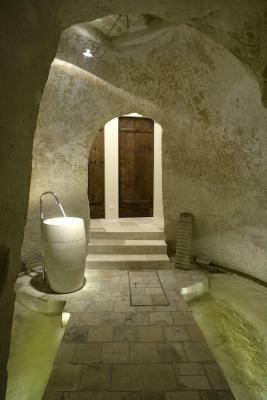 The stone bathroom has a shower. 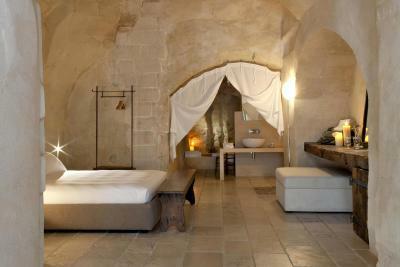 This deluxe room on 2 levels features a large bathroom carved out of rock with very large shower and views of the main square. This double room features a hot tub, mini-bar and electric kettle. 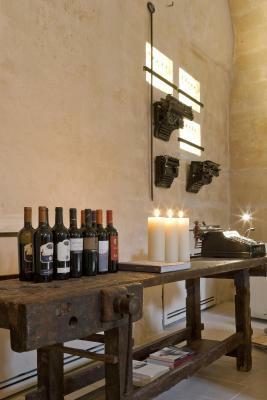 House Rules Corte San Pietro takes special requests – add in the next step! ATM card Corte San Pietro accepts these cards and reserves the right to temporarily hold an amount prior to arrival. Corte San Pietro accepts these cards and reserves the right to temporarily hold an amount prior to arrival. 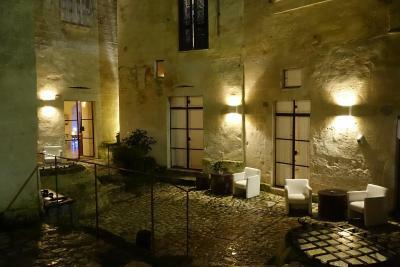 The weather, unfortunately, was very stormy and the cobbled pathways are like an ice rink when wet - this isn't a negative of the hotel, but just so others are aware. The city itself was okay. Beautiful, but packed with tourists and the Coperto was at times up to 4euro per person which is double if not more than where I've paid elsewhere in Italy. The style of the hotel is that most rooms are apartment styles off of courtyards outside of the main hotel (only a few steps away, however), this meant that our room had a lovely courtyard off of the main doors - the downfall of this was a lot of tourists stop here with guides so you can have crowds of people watching you if you choose to sit here. For the price, I felt that the hotel not having a spa on site meant that if you like this feature, there are similarly priced hotels that are probably a better option. After walking all day through the city - a spa somehow becomes a must! On leaving we were charged city tax however this had already been charged via Booking.com - travelers I would advise that you double check what hotels your city tax was included in the rate with and which were not. I've requested a refund through Booking.com and still waiting to hear a reply. 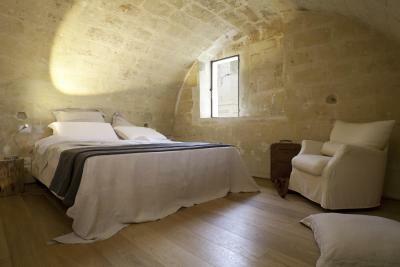 Lovely room with a luxurius but traditional feel about it. I had a room with a turkish bath which was nice, only downfall is the shower is in the same room and therefore you cannot leave on and took around 3 hours to heat up to 45 degrees. The air filtration is also not great which leaves a musty smell to the room after you've used this feature. Breakfast with both buffet and served plates of tapas style also (tomatoes in olive oil & herbs on toasted bread, fruits, and cheeses). The buffet had further cheeses, yogurts, foccacia etc. I did wish they had also provided the ability to self-serve some of the tomatoes etc. My partner commented he felt there could have been a wider range of the cheeses & meats with some olives etc. Good coffee. The room was well furnished - stylishly. 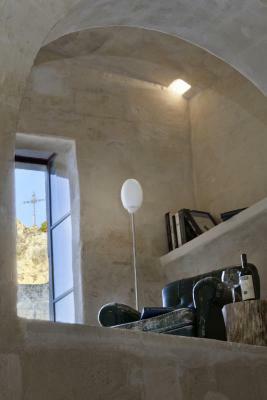 Charming small property in the heart of Matera’s Sassi district run by lovely family and staff. 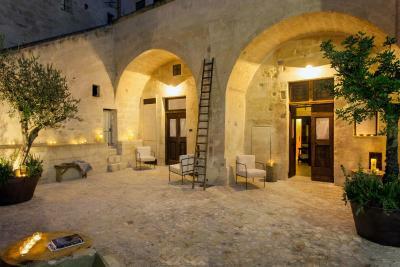 They helped make our stay in Matera so special - airport transfers, local guide, restaurants and wonderfully hospitality. Aperitivi in the courtyard was an evening highlight. Stafff were extremely friendly and helpful. Decor very tasteful. Right in the middle of things but still quiet. Everything. Delightfil breakfasts! Refined, delicious. The shower pressure can be stronger. However the water was hot and everything else was perfect. 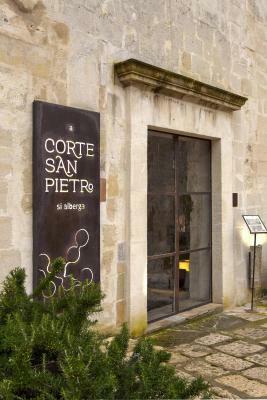 Corte San Pietro is really an experience. 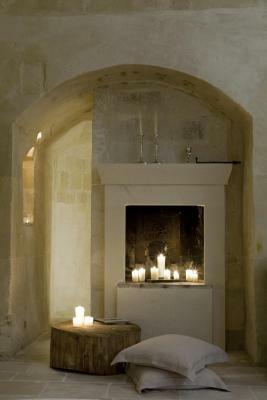 The rooms were amazingly maintained and the experience is wonderful in the stone carved property. The owner is very friendly and helpful, as are the staff. Very professional and responsible for helping to organise transport, parking and restraurant reservations. The breakfast is excellent. 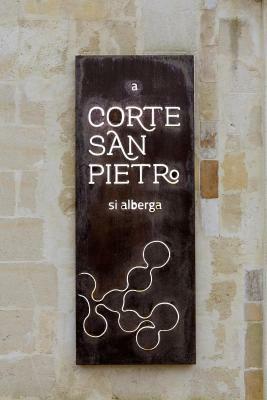 The experience has been amazing and I would definitely recommend Corte San Pietro to anyone visiting Matera. I love Italy for fresh orange juice at breakfast & I missed that here. Only other issue was due to allergies & I’m not sure if it’s possible not to have dampness/ mould living in a Sassi in winter - we still loved it. Other allergy sufferers might not though? The staff here are amazing!! 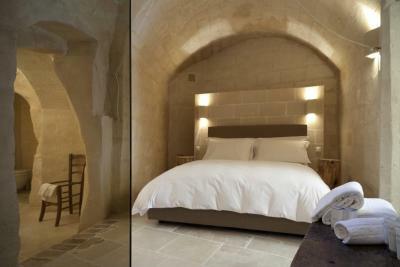 Location & room also amazing. Only complaint was a mouldy smell that’s due to dampness I suppose? We were there in winter after all. My husband has bad allergies, so it was hard for him. We ate at Francesca’s, very close by, incredible! Recommended kindly by Anna at the hotel. Very memorable & lovely stay. The staff & owners couldn’t do enough to welcome us and make our brief visit memorable. Would definitely recommend.